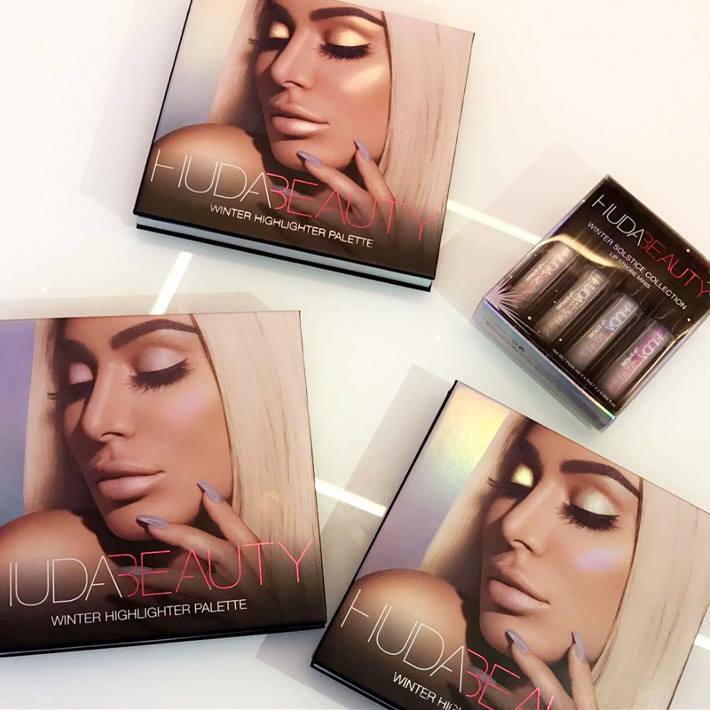 Huda Beauty has officially revealed her upcoming Winter Solstice 2017 Collection. Actually she did more than that, posting swatches of Winter Highlighter Palette and new Lip Strobes. I was just trying to find the budget for these launches when this morning I found out about Huda Beauty Obsessions Palettes. Yep, that’s right, more new and exciting products are launching soon. Keep on reading to find out more! If you are impatient, check out my Instagram. There’s something so magical about winter that I had to capture it with gorgeous products that would give the ultimate ethereal glow! Our Winter Solstice Collection includes a luminescent highlighter palette and mini Lip Strobe set that perfectly mimic the glistening icy complexion of a winter goddess – it is to die for! 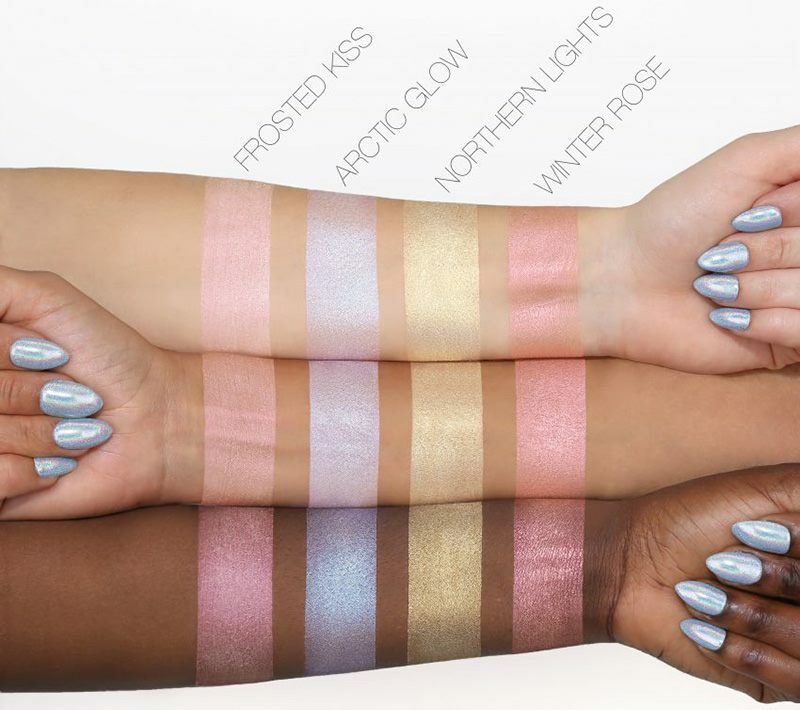 Frosted Kiss: Our signature melted strobe formula with shea butter has been refreshed for winter in an icy, iridescent pink. The creamy formula helps to smooth the skin and add a subtle glow, which makes the perfect canvas for layering powders on top. Arctic Glow: Our multi-tonal opalescent shade with flecks of blue and lavender pearls looks divine swept across cheekbones for a flushed complexion. Northern Lights: This holographic highlighter with duochrome tones of soft gold and bronze is the perfect pop of color when it catches the light. Winter Rose: Dust your Cupid’s bow, cheekbones or lids with this rosy-pink powder highlighter that has a shot of silver to create an amazing metallic effect. Charmed: Reflective pearls with a coral-tone perfectly match our Frosted Kiss melted strobe. 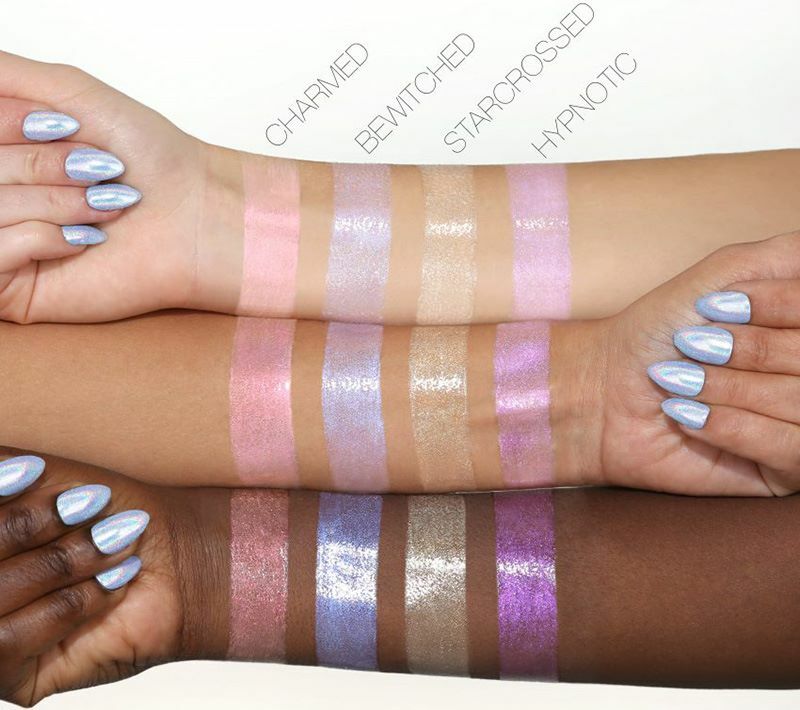 Bewitched: An opalescent shade with warm blue and purple undertones. Starcrossed: Duochrome tones in white gold and subtle bronze tones. Hypnotic: A combo of cool pink and silver undertones that give a unique metallic effect. Today the latest news presented by Huda Beauty is the launch of four new Obsessions Eyeshadow Palettes. These are mini / travel-size palettes which feature for $27.00 each. Some Sephora stores already have them on the counters so check out your local counter and see if you are among the lucky ones. Huda, teased these palettes on her Instastories earlier today. I just woke up when I saw these beauties on Instagram and I feel in love with them instantly. I’m only wondering if all the shades are new or they are also repromotes from her previous two palettes. I’m planning on getting them all, Warm Brown, Mauve, Electric and Smokey but I shall decide after I’ll swatch them at the counter. Each palette features nine shades with matte and metallic textures (maybe glitter as well). The shades are really pigmented and intense as Huda swatched some of them on Instagram. Here are just a few examples. When I thought I completed my Christmas wish-list for beauty purchases, these bad boys come along to ruin my plans. My holiday budget is trashed completely as there are so many gorgeous products launching this season. This reminds me of Gucci Sunstone Illuminating Powder, a gorgeous item with a butterfly pattern. I just saw swatches and I’m in looooove. I really like that cool toned Huda neutral palette (top left hand corner). I haven’t seen that one before and it looks pretty darn good to me.